I had wanted to visit the City Museum of Prague again for some time, but I had just not gotten around to it. I remembered how the intriguing museum took visitors through the joys and disappointments of Czech history. This time, I went to see a temporary exhibition about Prague during the 20-year existence of the democratic First Republic, but, of course, I explored the entire museum as well. It was even more impressive than I had remembered. In the main hallway, I saw the calendar dial for Old Town’s Astronomical Clock, painted in 1865 by well-acclaimed Czech artist Josef Mánes. The dial was divided into circular rings. I took notice of the medieval syllable calendar. The folk costume-clad figures represented the 12 months, celebrating Slavic identity. I recognized Troský Castle in the background for September, and I knew that December symbolized the tradition of Czech pig-slaughtering, a custom the European Union did not approve of. A castle addict, I was excited to see Bezděz Castle in the background of the portrayal of March as a young farmer did his ploughing duties in the foreground. 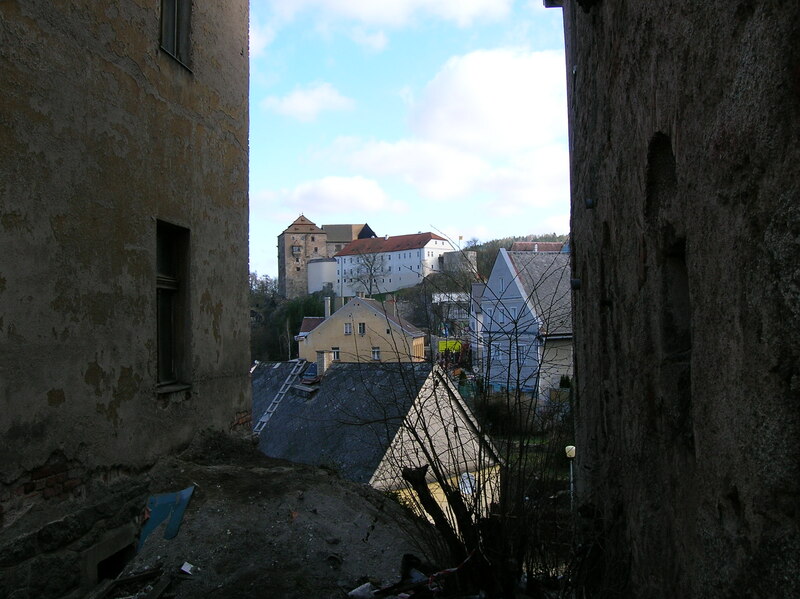 I remembered walking 4 kilometers from the train station to the ruins of Bezděz. It had entailed two kilometers of a steep, rocky incline that led to the remnants of what must have been at one time an impressive castle. I liked walking around the ruins, several pages that described each part in my hand, trying to imagine what it had looked like in its heyday. I wasn’t a big fan of ruins, but this one had charmed me. Mánes had also painted figures as zodiac signs. I saw dolphins with a plump cherub for Pisces. Sagittarius featured an Old Bohemian warrior while the depiction of Capricorn did not include any human figures but rather a cherub guiding a goat. I also noticed that Romanesque elements had greatly influenced the adornment on the dial. I recalled the Romanesque church in Regensburg, Germany, the façade an architectural delight. I had also seen many churches with Romanesque features in Czech villages. At the ruins of Vyšehrad Castle in Prague, St. Martin’s rotunda fit the Romanesque style. I walked into the prehistory section, not knowing if I would find it interesting as prehistory was not my cup of tea. 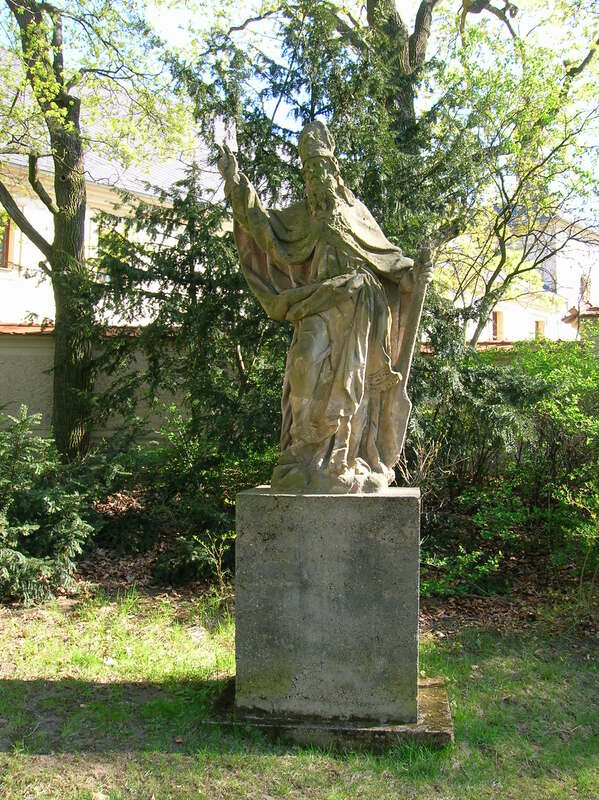 I discovered that the first archeological find in Prague was unearthed near St. Matthew’s Church in Prague’s sixth district, a nice walk from where I had lived for many years. The small church had an intimate flair, and if I had been religious, I would have gone there for services. I would also like to be buried there. It is a relatively small and beautiful cemetery in my favorite section of Prague, but I do not think that would be possible. The cemetery is home to some famous Czech artists – architect Pavel Janák and actor Jiří Kemr. I also learned that the first farmers in Central Bohemia came in 6 BC. Another interesting fact was that the Celts, in the second half of 1 BC, were the first people to wear trousers in Central Europe. The medieval displays were eye-catching. Frescoes and wall paintings from Prague houses were highlighted. I read that Prague’s boroughs were created in the 13th and 14th centuries when a medieval fortress had been built. I already knew the Old Town was founded by King Wenceslas I during the 1230s. I read about the origins of the various districts of Prague. A statue that got my attention showed Christ in agony, hailing from 1413 and made of linden wood. Ceramic stove tiles showed pictures of Hussite soldiers from the 15th century, when the Hussite wars ravaged the Czech lands. Rudolf II’s Prague was also featured in the museum section that documented Prague from 1434 to 1620. Artists had flocked to Prague, which had made a name for itself as a center of European Mannerism. Rudolf II’s collection of art and curiosities was certainly impressive. An art gallery at Prague Castle displayed much art that had been attained during his reign. I had also seen many of Rudolf II’s curiosities in the Kunsthammer in Vienna. Of course, the Thirty Years’ War was given much attention, as the Catholic victory over the Protestants would greatly influence Prague and Czech history for hundreds of years. Before the war, there were many Ultraquists in Prague society. The defining battle for the Czech lands was at White Mountain in Prague during 1620. The townspeople of Prague were not happy with the then current legal, economic and political roles of towns and took part in this battle. During the war, the Saxons occupied Prague, and the Swedes pillaged and bombed the New Town in Prague. I remembered living near the Vltava embankment in the pleasant New Town. I tried to imagine the damage and destruction that those bombs had brought to the quarter. It must have been a devastating sight. Prague became part of a province after the war, and Baroque art and architecture became the fashion. In 1624 Catholicism became the only religion allowed in the Czech lands. During the Baroque period, Czech artists including the Dientzenhofer family of architects, sculptor Matthias Bernard Braun as well as painters Karel Škréta, Petr Brandl and Norbert Grund made their way to Prague in 1710 and had a great influence on the art in the city. The reign of the Habsburgs brought with it a long period of Germanization and a centralized monarchy that dominated the 18th century. Some of the exhibits on display from this century were intriguing, to say the least. A table clock took on a macabre character, featuring a skeleton wielding a scythe. There was also a wooden throne from St. Vitus Cathedral, made in the second half of the 17th century. A glass garden with musicians and nobles was another impressive creation. Then Prague experienced peace for 100 years. The exhibition ended with the Baroque section, but there was more to the museum, specifically Antonín Langweil’s model of Prague, constructed from 1826 to 1837. He had worked in the University Library at the Clementinum when he was not creating this amazing three-dimensional model of the city. The precision and detail left me in awe. He did not finish the project, but what he did create is astoundingly beautiful and innovative. 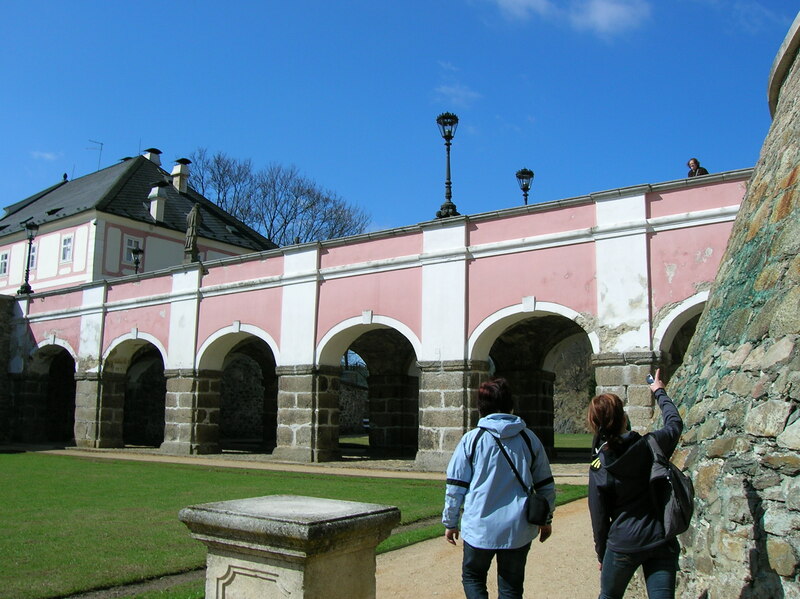 I saw many sights I had first become acquainted with when I was a tourist in the city during the summer of 1991 – Prague Castle, the Charles Bridge and the Lesser Quarter’s main square as well as the Old Town, St. Vitus Cathedral and the Old Jewish Cemetery. I recalled walking to Prague Castle across the Charles Bridge early each morning when I first moved to Prague and lived in the Old Town. I would never forget standing below the balcony of Prague Castle on a frigid February evening in 1994 while Václav Havel gave a speech as the first President of the newly created Czech Republic, his wife Olga by his side. I recalled the moment I had set my eyes on Old Town Square for the first time, back in 1991, feeling at once that I had found my true home. What I found just as impressive as the exhibits were the richly adorned coffered ceilings in the museum. The painting is incredible. One used to be in a house in Prague and hails from the 17th century. On walls of the upper floor is a magnificent painting of the city. While I already had a solid foundation in Czech and Prague history before this visit, I realized how important this museum would be as a learning experience for tourists who really wanted to become acquainted with the historical events that had shaped the city’s identity through the Baroque era. It was such a shame that the displays ended with the Baroque era, but there was no more space in the museum. I thought that a museum of more recent history should be created with a special room celebrating Václav Havel as a dissident, playwright and president of Czechoslovakia and the Czech Republic. Walking through this museum, I was moved by the lands’ often tumultuous history and reminded how the history of the city seeps into my soul every day, no matter where I am. Just looking around me, I feel the history, which is one of the traits I like most about Prague. It is one reason I feel at home here and don’t want to leave. Tracy Burns is a writer, proofreader and editor in Prague. When I bought my ticket to visit the underground cellars below the center of Pilsen (Plzeň in Czech), I thought the tour would be interesting. However, I had no idea it would be fascinating and one of the highlights of my many trips to this dazzling city in west Bohemia. The ticket office was at the entrance to the Brewery Museum, which I also visited and found intriguing, even though I rarely drink alcohol. Admittedly, I wasn’t a big fan of visiting underground areas, and I admit that I was a bit scared for my safety when I had to put on a hard hat. It turned out that there was no reason to be afraid. The corridors were not wide but provided enough room for one person to walk through. I can at times feel a bit claustrophobic, but I did not have a problem there. In some parts in caves I had visited, I had been squashed between rock formations, and the paths had been very tight. The guide explained that we would explore 800 meters of the underground area, though the cellars were actually much more extensive. The passages can be traced back to the early 14th century. They were built soon after the founding of the town by the first houses that had obtained the right to brew beer. The cellars served various purposes. Food was stored there, and beer was brewed in the underground areas. During sieges of the city, inhabitants took refuge in this labyrinth. The passages also became important parts of the city’s defense system. In addition, during the Middle Ages, the pubs above the passages were ordered to close at a certain hour, and the establishments carried on serving beer in the cellars after hours. The eloquent guide told us the different eating habits of the poor and the rich during the Middle Ages. Poor people used ceramic tableware and ate mostly vegetarian food because meat was too costly. Birds and fish made up part of their diet. The wealthy, though, used glass, metal and silver tableware and ate a lot of meat and spices. They ate with their hands, though they used knives when eating meat. The well-off citizens refused to use forks because they thought they resembled pitchforks and were bad luck. I saw beautiful tiles from stoves constructed in the Middle Ages. One that caught my fancy showed Saint George fighting the dragon. I also saw an exquisite decorated water pot from medieval times. The guide talked about the three symbols on Pilsen’s coat-of-arms – an angel, a camel and a greyhound. I loved the story about how the camel came to be one of the city’s symbols. During the Hussite wars, the Hussites attempted to overtake the city four times, but never prevailed. The Hussites tried to frighten the inhabitants of Pilsen with a camel. However, their plan backfired in a major way. The inhabitants liked the camel so much that they put the animal on their coat-of-arms. In the end, the Hussites left, defeated. The camel stayed. The guide also explained that the three golden fountains of contemporary art on the main square stood for the three symbols of the city. The T-shaped fountain stood for the angel while the F-shaped one represented the camel. The Greek letter stood for the greyhound. I was captivated by the three fountains, though I had not understood what they symbolized. Though contemporary, they fit in well with the medieval atmosphere of the main square dominated by the Church of Saint Bartholomew. I was impressed that they by no means take away from the square’s historical charm. I also saw samples of ceramics from the 14th to the 17th centuries. Two objects that caught my attention included a unique 16th century sieve and a piggybank from the 17th century. I was intrigued by the many wells – we saw 20 of them! When we reached one point, the guide told us that we were standing under a house that once printed books in Pilsen. The first book published in Pilsen hailed from 1468. I also was intrigued with a pair of very pointy shoes, often referred to as poulaines. They looked very uncomfortable. I did not understand how someone could squish up his or her feet into those shoes. How would it be possible to walk in them? During the Middle Ages, very pointy shoes were a sign of wealth. I recalled that they had been particularly fashionable in France during that era, as evidenced by The Book of Hours. The pointier your shoes were, the richer you were. There were many guilds during the Middle Ages, including a guild of manufacturers of tiled stoves. I saw many examples of tiles from stoves during the tour. Emperor Rudolf II lived in Pilsen for one year when the plague was ravaging Prague, and the inhabitants presented him with a tiled stove to show their appreciation that he had chosen their city as his temporary residence. I saw some cannonballs used by the Hussites. They weighed 200 kilograms each! The cannonballs were able to demolish the first town wall, but they did not destroy the second wall. The inhabitants of the city threw the cannonballs back at the Hussites, foiling their enemy’s plan. A functioning water wheel fascinated me. It was a replica of one that dated from 1532. I also saw remains of a water town hailing from 1847. It had played a role in the town’s defense system. Emil Škoda, an entrepreneur who set up the Škoda factory that would play a major role in European industry during the 19th and 20th centuries, was born in the water tower on November 19, 1839. The 2002 floods had made their way to Pilsen. A sign showed the high level the water reached on August 13 of 2002. The entire underground had been immersed in water. I recalled my personal experience with the floods for a few moments, lost in thought. During 2002, devastating floods ravaged the republic. I was in Slovakia at the time, so I did not witness them first-hand. Even though the house where I lived in Prague was on a hill, there was significant water damage because we had had no roof because it was being repaired. There was only a protective covering. Rain from the downpours seeped into my flat. I came back to find some of my clothes ruined and mold on the walls. My cat was traumatized. Luckily, my books were all dry. Living through the aftermath of the floods was one of the most difficult times of my life in Prague, where I have lived for 23 years. When we reached the end of the tour, I was enthusiastic and bewitched by the information I had learned about the Middle Ages and the history of Pilsen. The objects I had seen during the tour were very intriguing. I thought the tour was organized well. I had taken the tour in English because that was the one offered at the time I was able to visit, and the guide had an excellent command of the language and a talent for communicating effectively. I am convinced that the underground tour should not be missed when tourists are visiting Pilsen. It is a must-see. When you come back above ground, you understand how the Middle Ages affected Pilsen and have a greater appreciation for the city. I left Pilsen for Prague about an hour after the tour, and I was certainly more than satisfied with my day trip. I waited and waited. The tram going to the Dejvická Metro station was late. I kept glancing at my watch. If it did not come soon, I would miss the 6:40 a.m. Saturday bus to Karlovy Vary. 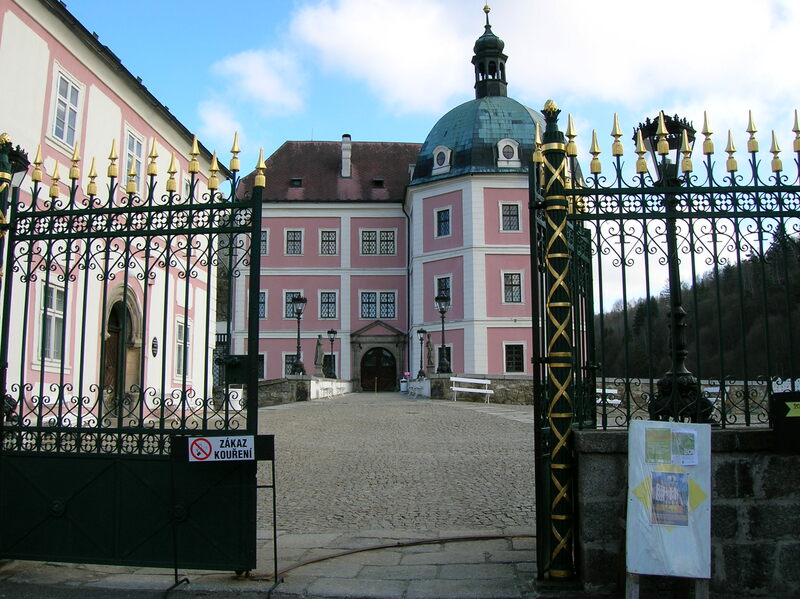 I had been looking forward to seeing the castle and chateau in Bečov nad Teplou again for some time. I had planned this trip so carefully. Where was the tram? There were always trams coming in the direction of the metro station. Why did I have to wait so long? Had there been an accident? Was there a problem with the tracks? My heart was racing. Where was the tram? Some nerve-racking minutes later, the tram did come, and I made it the Student Agency bus just as the doors were about to close. 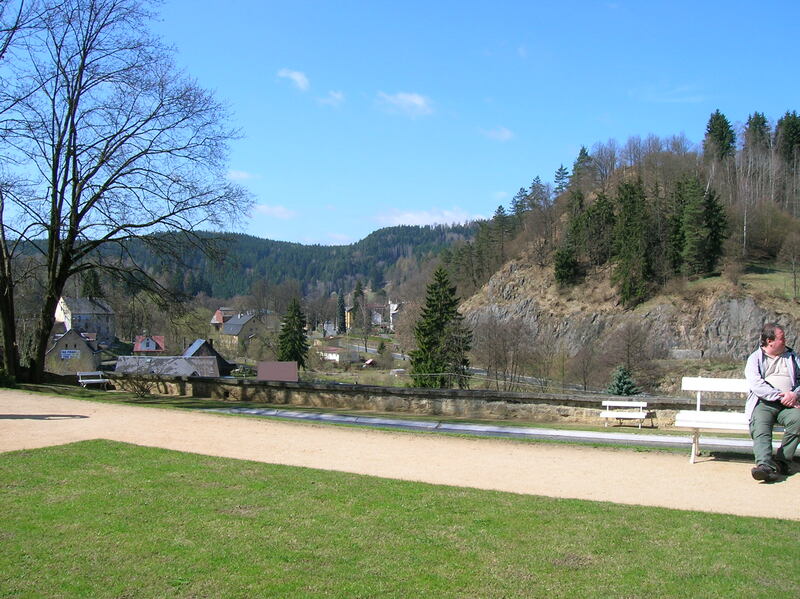 During the two-hour trip to the famous Czech spa town, I fretted about whether or not I would make the train to Bečov nad Teplou. I only had 15 minutes to change, which should be enough if the bus was on time. Still, after the incident with the tram, I was worried…. It turned out that the bus dropped passengers off at the Karlovy Vary train and bus station at 8:30 a.m. rather than its 8:45 designated time. I had an entire half hour before the train departed. First, I waited in line at the only window for train tickets. There was a line of potential passengers, but no one appeared to be manning the window. After waiting an excruciatingly long 15 minutes, someone did come. The train was already on platform three. When I saw the Viamont train, I was surprised. It was new, clean and comfortable, not like those old red trains with uncomfortable seats that I had often taken to small towns for so many years. The stops were even announced and displayed electronically on a sign above the seats. I did not have to worry about getting off at the wrong stop – not this time anyway. The train ride was scenic and relaxing. We traveled through woods and also past a golf course with ponds and a stream. I could see the Bečov nad Teplou chateau and castle on a high rock from the train stop in the valley. From there it was about a 15-minute walk through the small town with some narrow, steep side streets and a church on a hill. Passing a half-timbered house that seemed to belong in another century, I came to the picturesque square with its pensions, restaurants offering outdoor seating, antique store and souvenir shop. On my way I noticed many Baroque or Classicist houses, which were in need of repair. From the square I gazed at the pink Late Baroque chateau and headed directly to the box office. It was only 9:45 a.m. The chateau and castle opened at 10:00 a.m. Yet there was already a line of at least 10 people ahead of me, mostly seniors. In the end there were about 20 people ready for the 10:00 a.m. tour, so they were split into two groups. 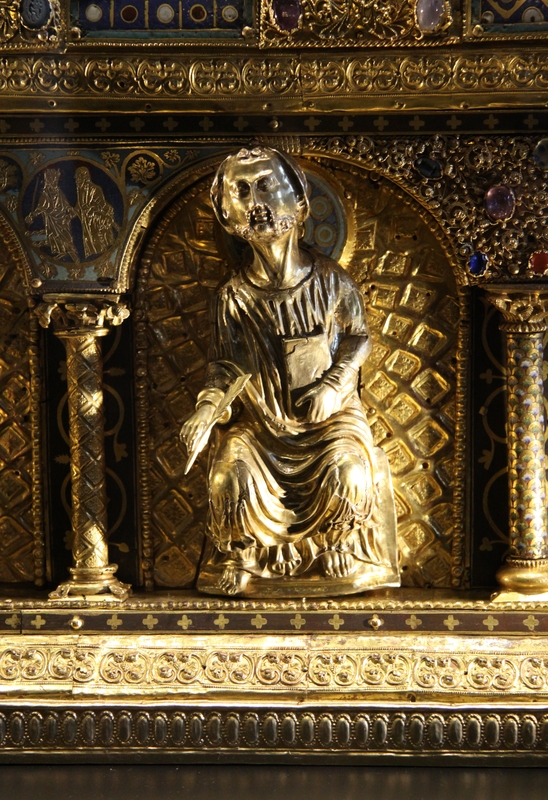 One group started with the historic interiors, and the other group – my group – began with the Romanesque reliquary of St. Maurus, where fragments from the bodies of three saints – St. Maurus, St. John the Baptist, and St. Timothy– were kept. I had never been on this tour because the reliquary had opened to the public in May of 2002, and my first visit took place during March of that same year. The small bridge featured two impressive statues. First, I crossed a small bridge decorated with the statues of John Nepomuk and the Jesuitical clergyman Jan de Gotto, both of which dated from 1753. I reached the front gate, framed in a 16th century Renaissance portal. Before going upstairs to the rooms dealing with the holy relic, we stood in a hallway decorated with portraits of soldiers riding horses off to battle. I noticed the plume on a soldier’s helmet and the castle in the lower left-hand side background of that portrait. The castle seemed so small and powerless against the mammoth soldier seated on a horse that seemed almost to bolt out of the canvas. I also was impressed by the elaborate saddle that the artist had rendered. On the floor above the hallway, a display case in the first room dealing with the unique treasure featured a small Christ figure, a marquetry cross that appeared to be inlaid with gems and scapulars of the Beaufort-Spontin family. It also contained pictures of relics found in the richly decorated tomb box, such as small textile bags, bits of paper and small stones. A map covered another wall. The guide pointed to Belgium and explained that the reliquary hailed from a Benedictine abbey in that state, from a city called Florennes. 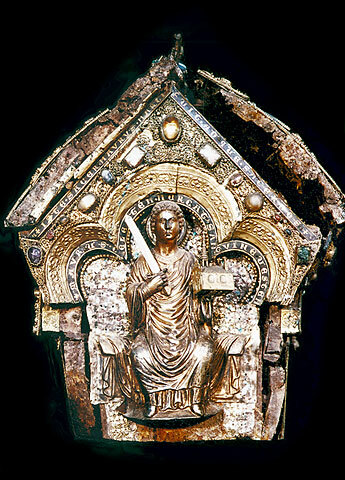 The reliquary dated from 1225 to 1230 and contained the remains of the three saints mentioned above; yet more recent DNA tests proved that there were the remains of five people in the chest, two of whom are men from the third century AD, according to the guide. He also explained that these sorts of shrines were important in society because people believed that they were the source of health-related miracles. He added that Saint Maurus was a sort of mystery man for scholars; it is only known that he was a saint and martyr in the first or third century AD, nothing more. After surviving the French Revolution, the unique object was kept at St. Gengulf’s Church in Florennes. When Alfréd de Beaufort bought the reliquary in 1838 from a Belgian church council for 2,500 francs, it was in a decrepit state. 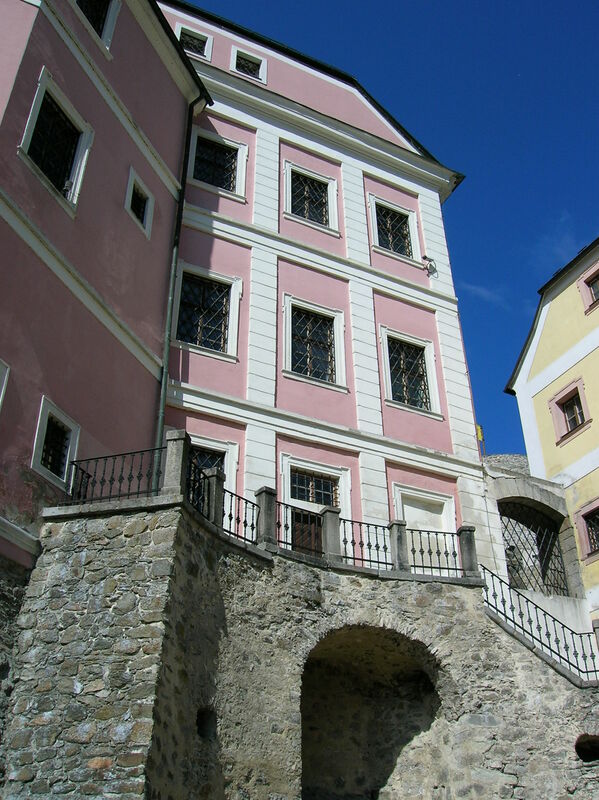 He brought it to Bečov and had it repaired from 1847 to 1851. 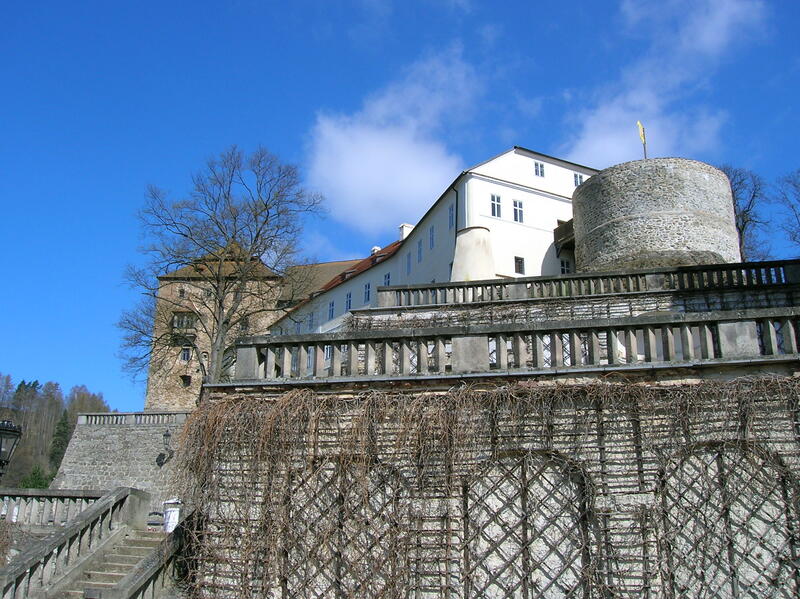 When his grandson had to flee in 1945 after the second world war because he had cooperated with the Nazis, he hid the reliquary in a backfill of a chapel in the castle here. In the next room there was a reproduction of a partial mural from the castle chapel, which, along with the rest of the castle, was not open to the public. (Visitors were, however, allowed inside the chateau’s chapel.) The guide elaborated on the fascinating history of the treasure, which sounded like something out of a detective story. The reliquary had remained hidden for 40 years. In 1984 an American named Danny Douglas wanted to buy an unspecified treasure hidden in the Czech lands during World War II and was willing to pay 250,000 USD for it. This was a financial offer that the Czechoslovak government could not afford to pass up. But the Czechs had to figure out which artifact he intended to purchase. During further talks with Douglas, the Czechs were informed that the object was oblong, the size of a conference table, hollow, made of metal and buried about 100 kilometers from Nuremberg, among other facts. Finally, they narrowed it down to the reliquary, which had to be buried somewhere in this chateau and castle. A black-and-white video dated November 5, 1985 showed criminologists unearthing the chest in the chapel. I could not help but notice how dilapidated the façade of the building was, how different it looked from today. Of course, the Czechs would not allow the treasure to leave the country. In the end, the contract with Douglas was not signed. The next room dealt with the restoration process. In display cases I saw tools and utensils used to fix the reliquary, such as chasers, a metal chiseller and engravers. The guide also mentioned that the statues on the exterior of the reliquary were made of silver tin and took 11 years to restore. Imagine that! Eleven years! When the criminologists found the treasure, it was damaged. The metal pieces were corroded, and parts of the figures and reliefs were no longer attached to the relic. Due to issues relating to property rights, restoration did not begin until mid-1993. The guide also explained why the treasure with its fragile, small gilded silver statues took such a long time to restore. Restorers had to make miniature, detailed parts for the statues, hands and arms for example. The restoration of the 12 apostles and reliefs on the roof proved the most challenging. The young man conducting the tour mentioned that the restorers had to drill about 3,000 holes for nails to keep the object from getting damaged. Don’t overlook the fact that the chest included filigree with pieces of glass, precious stones and gems. Another display case featured the plaster casts for the circular reliefs on the chest, showing biblical scenes. In one Salome carried the head of St. John the Baptist. Another featured the dance of Salome. Plaster casts of saints were also displayed, including Saint Paul, Saint Jude Thaddeus and Saint Bartholomew. A large picture on one wall showed that the treasure was decorated with birds and mythological figures and inlaid with gems. 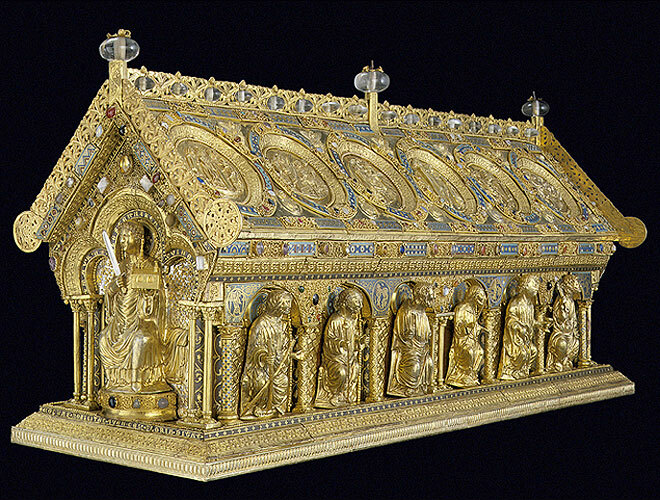 No one knows how the gems were placed on the chest because not even a laser is capable of doing that kind of precise craftsmanship, and they certainly did not have microscopes back in Romanesque times. In the fourth room I looked at the original oak box that had been found inside the chest. The restorers had to create a new wooden core for the object. The display cases along the walls showed various reliquaries. In one case I saw two gem-studded rings. I also gazed at a number of golden Baroque monstrances, so elaborate that they almost made me dizzy. Then we finally came to the dark room containing the unique treasure. We only had five to seven minutes in the space. I noticed how Saint Maurus’ drapery seemed to flutter as he gripped a sword in one hand on the front of the chest. Christ was giving a blessing on the opposite side. On the roof were 12 large reliefs relating the life of Saint Maurus and of Saint John the Baptist. Small columns with floral decoration also decorated the chest. Apostles were shown with staffs; one gripped a cross. Saint John the Evangelist held a goblet. I noticed the precise curls in his hair as well as his flowing drapery. The detail in the saints’ facial expressions was also stunning. Golden swirls and gems decorated the treasure as well. I noticed the precision of the inlaid gems and the precision with which the small hands of the apostles had to be made. My head was swimming. There was so much detailed decoration to take in at one time. I wanted to study the chest in small parts, truly appreciating the precision of the figures and reliefs. I knew I was staring at one of the most beautiful artifacts I would see in my life. After a short time, we were ushered out of the dark room, and the first tour ended. In 10 minutes, it would be time for the tour of the interior rooms. I was enthralled by the first tour and excited about the second. Donjon, taking its name from Early Gothic castles shaped like towers in southern France, had been a tower of four floors with toilets on every floor. The family had lived in this section of the castle. 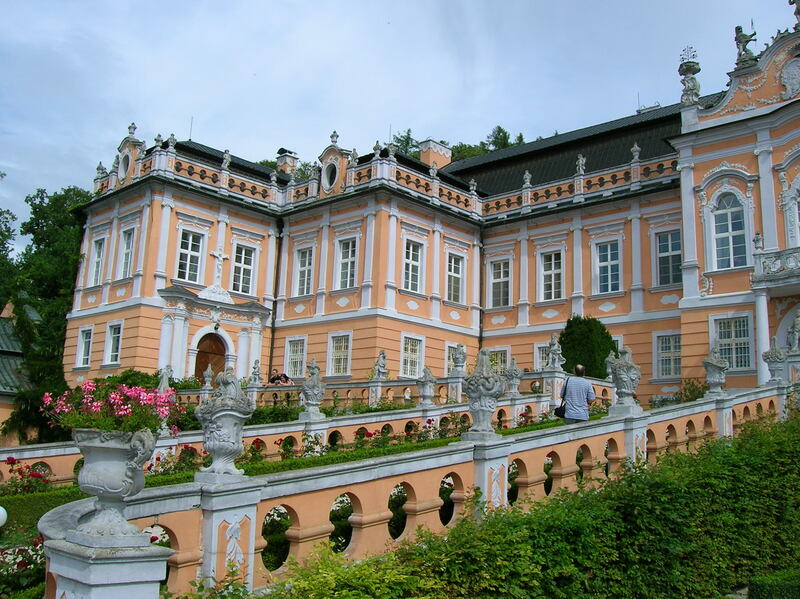 The Pluhovský Palace, still flaunting a Classicist style, was comprised of three houses. A watch-tower also had stood on the property, though it is only six meters high now, as it had been shortened and transformed into an observation terrace during the 19th century. 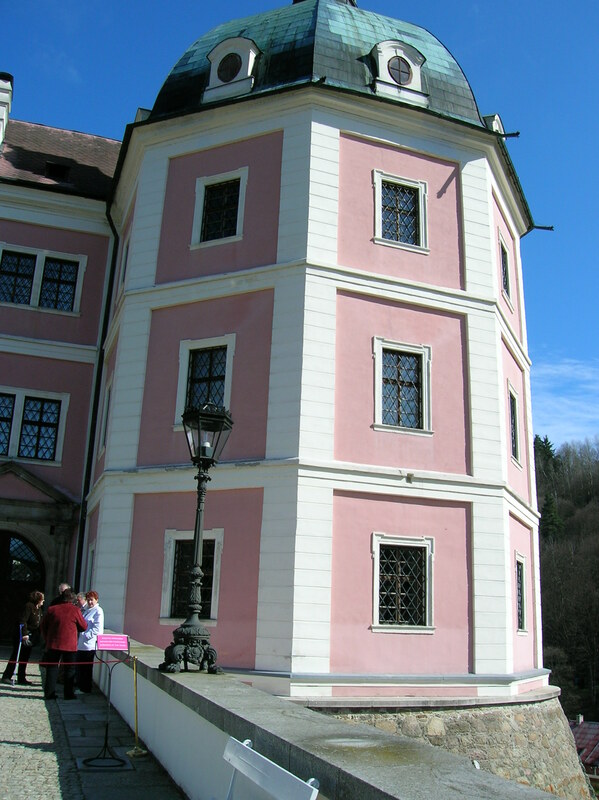 The vibrant, pink Late Baroque chateau, built in the 18th century by the Kounic owners, was one dominating feature of the model. The guide familiarized us with the history of the castle and chateau as I glanced occasionally at the portraits, maps and black-and-white landscapes on the walls. In the 14th century the village’s status was raised to that of a town. 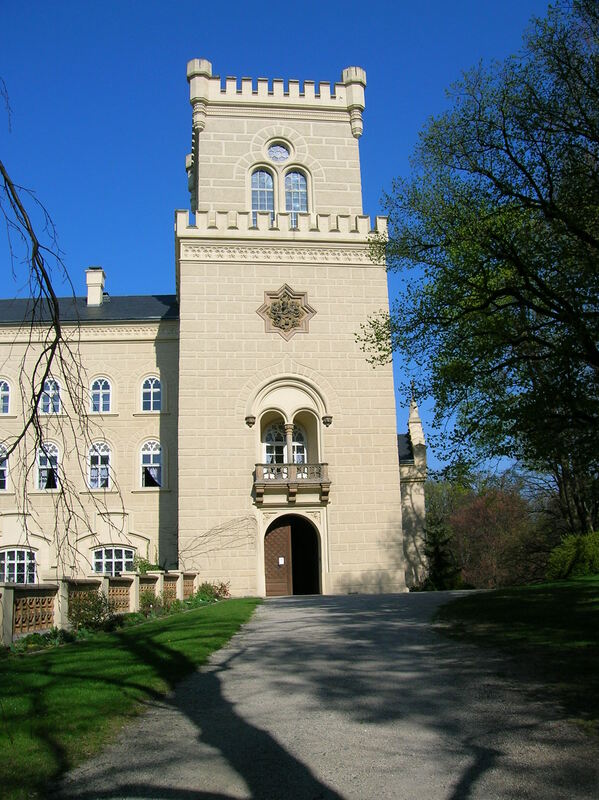 The castle remained the property of the Hrabišic of Osek clan until the beginning of the 15th century. From the 13th to the 16th centuries, the place prospered thanks to its gold, silver and tin mining. In fact, during the 16th century, Czech tin from the Bečov region was praised as the best in Europe. The manufacturing of pewter added to the town’s wealth. But times changed as the Hussite army destroyed the castle during the Hussite wars that took place from 1419 to 1434 and pitted several factions of the armies of martyr Jan Hus’ followers against each other. The Holy Roman Empire, Hungary, The Pope and others joined forces with the moderate Hussites. The castle was also in decline after the Thirty Years’ War, and the town never again reached its former level of prosperity. 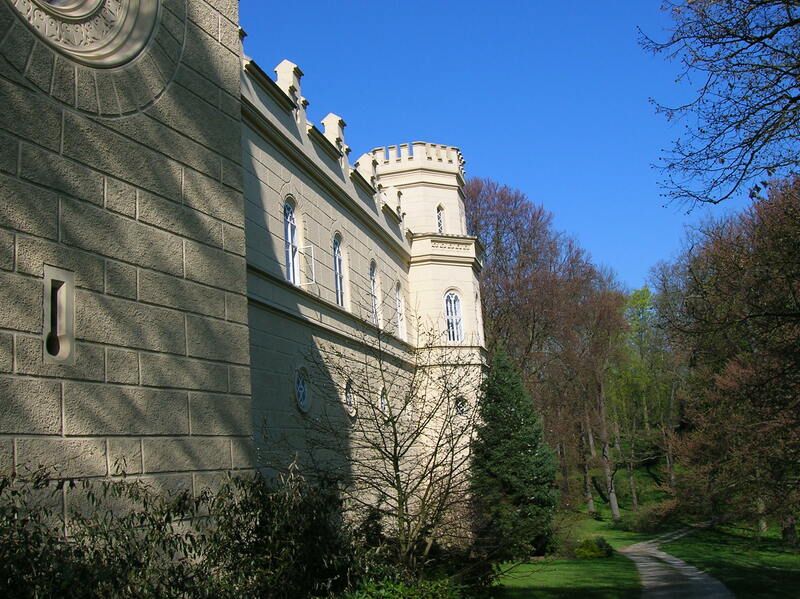 During the 18th century the Kounic family bought the castle, adding the chateau and bridge. Then in 1813 Fridrich Beaufort-Spontini took over as the owner, which was a turning point in the buildings’ history. The Beauforts made many improvements to the castle and chateau. 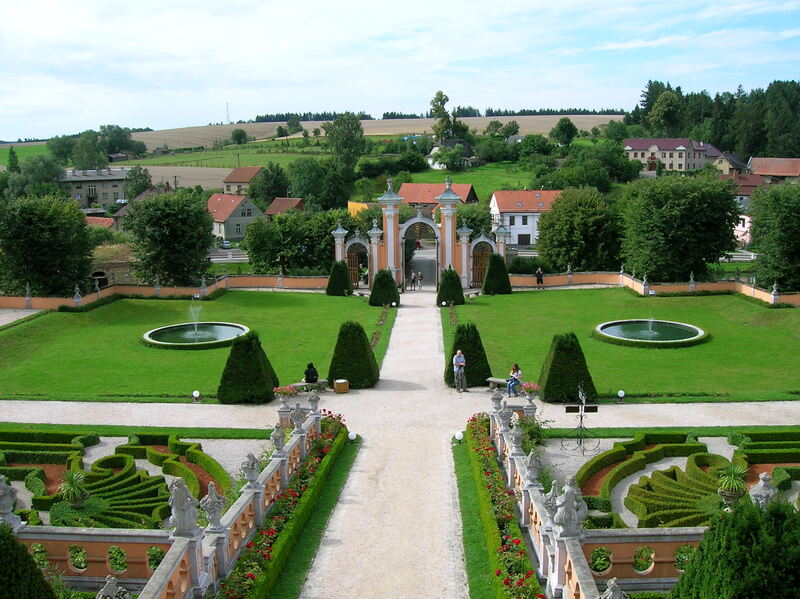 It was Alfréd Beaufort who created a Baroque style park with six levels of terraces. 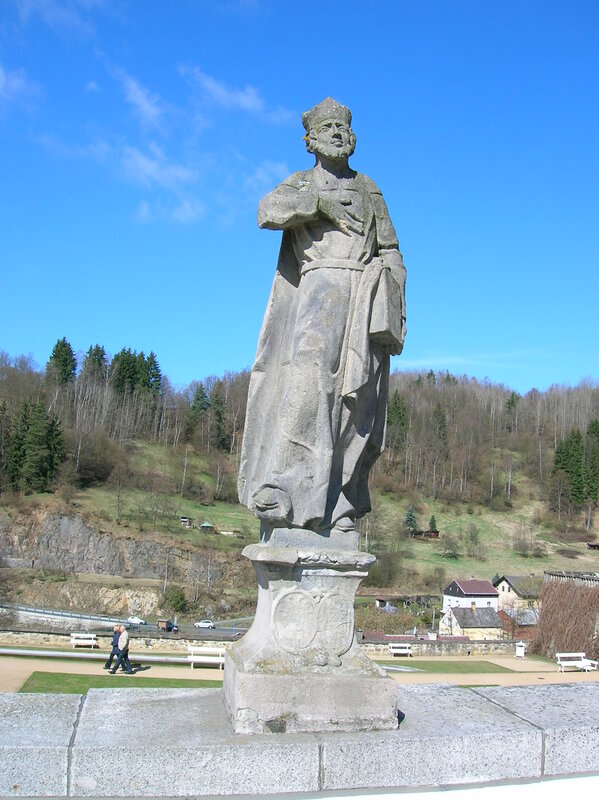 He repaired the castle and chateau, set up the botanical gardens, constructed an open-air theatre and brought the reliquary of Saint Maurus to Bečov. 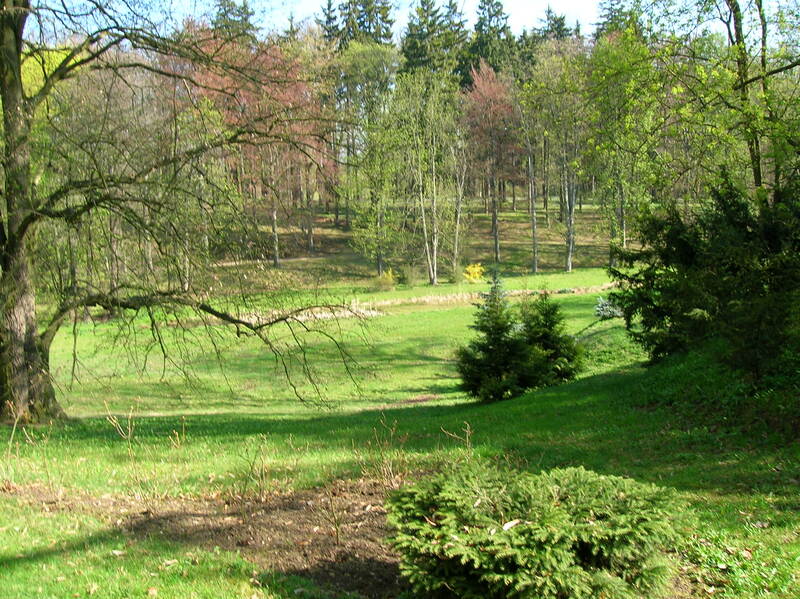 Because his grandson Heinrich collaborated with the Nazis during World War II, the property was confiscated. Objects in the castle were plundered. Townspeople stole some artifacts while other pieces of art and crafts were sold to antique stores. After that, various owners were in charge of the castle and chateau. 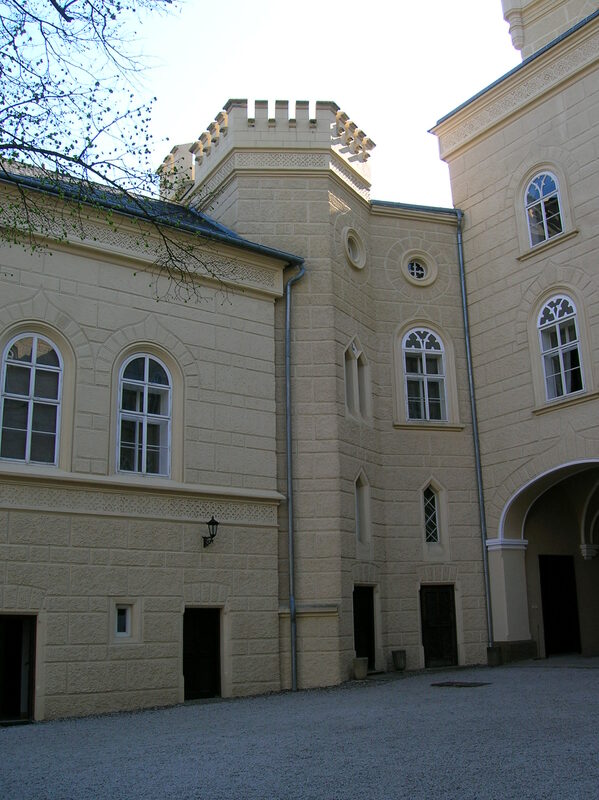 The castle became a school for workers while Pluhovský Palace was supposed to, but never did, become a museum. 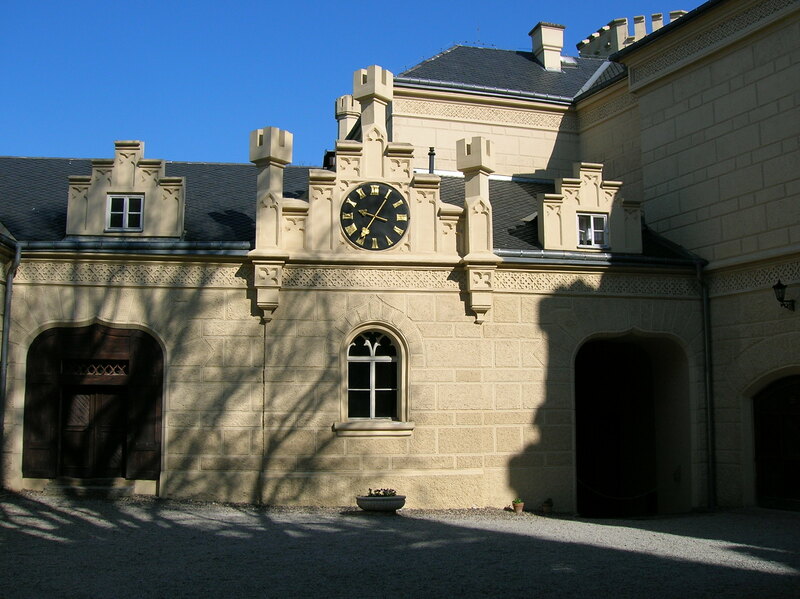 Reconstruction of the property took place from 1969 to 1996, when visitors were finally allowed inside the Late Baroque chateau. 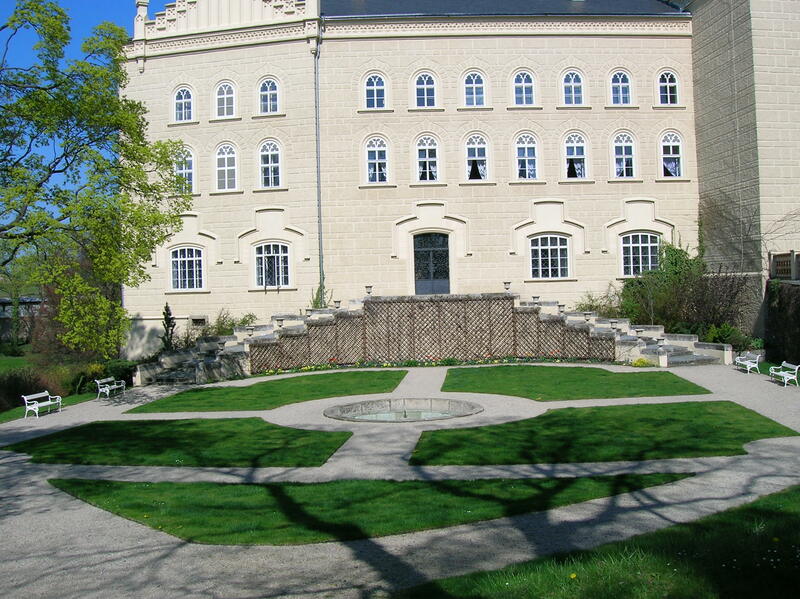 Back then a West Bohemian Gothic Art exhibition was housed in the chateau. Now the original furniture has been put back in the building, though the spaces are organized differently than they had been in the 19th century, when the chateau’s rooms had served a representative function, while the family had been living in the castle. On the ground floor we entered the library, where each bookcase was decorated with four columns and had a triangular slanting roof culminating in a point. Reliefs of a female reading adorned the bookcases, which shelved 3,000 books for representative purposes. The chateau had another 14,000 books stored elsewhere. From there, we went up the staircase with the oak balustrade that originated in the 19th century to a landing decked with hunting trophies, rifles and swords intertwined as well as a tattered Austro-Hungarian army cap. I was impressed with the vibrancy of the pink hue in one room that sported a pink couch, pink chairs and a pink tablecloth under a glass table. The gold décor on the white tea cups also caught my attention. I could see the tower from the window. But the most significant part of this room was its graphics’ collection, hailing from the 17th century Netherlands, including one by Sir Anthony van Dyck. There were also four portraits of properties – three chateaus and one castle – owned by the Beaufort family when they had Bečov. Graphics of mythological figures and floral still lifes were on display, too. I also noticed how the female figures in several portraits sat so stiffly and how delicately flowers were handpainted on one vase. The Red Parlor was next. A blood red couch and four armchairs gave the space its name. One painting from the 17th century Netherlands sported a music theme. Another painting showed nobles in an Italian park. My eyes darted to the brown and white marble columns in the foreground. There were two mistakes in the painting, the guide explained. Firstly, the trees depicted could not grow there. Secondly, through the summerhouse window it would not be possible to see a forest but part of the port and sea rendered next to it. We also saw a toilet with a keyhole. Only the person who had the key could use it. Lower-class nobles would have cleaned it. I also glanced at a portrait of an elegant lady with ruddy cheeks. The Tapestry Parlor featured two huge tapestries pictorially narrating the story of David and Goliath. They were made in Brussels from 1620 to 1630. The Baroque table was intriguing as well. Its legs seemed to be decorated in the shape of some strange sea animal. It turned out that the animal depicted was a dolphin, but the artist had never seen a real one so he had used his imagination. On a dresser stood a Baroque clock complete with a realistic-looking giraffe. Another tapestry hung from the wall in the next room as did several Spanish paintings from the 16th and 17th centuries. In one a woman was crying over the death of the Spanish king and another woman was protecting a child. Last but certainly not least we made our way into the chateau’s chapel. At the entrance stood two gold statues of what appeared to be griffins holding candlesticks. Saint Peter Chapel was built in Neo-Romanesque style around 1870. The gilded altar was simple with a painting of Madonna and the Christ Child. Mary held one hand down with her palm up as she looked straight at the viewer, challenging his or her gaze. Both the Madonna and Jesus sported golden halos. On the walls were 14 Stations of the Cross painted in white enamel on copper plates. I noticed how Christ was lugging a heavy, plain cross in one depiction. In another he was sprawled over Mary’s lap, dead, a halo over his head. A white tiled stove stood behind a secret door. What attracted me most, though, was the ceiling. The blue with gold décor on the ceiling made the room dynamic, made it feel almost alive, imbuing it with a distinctive power. 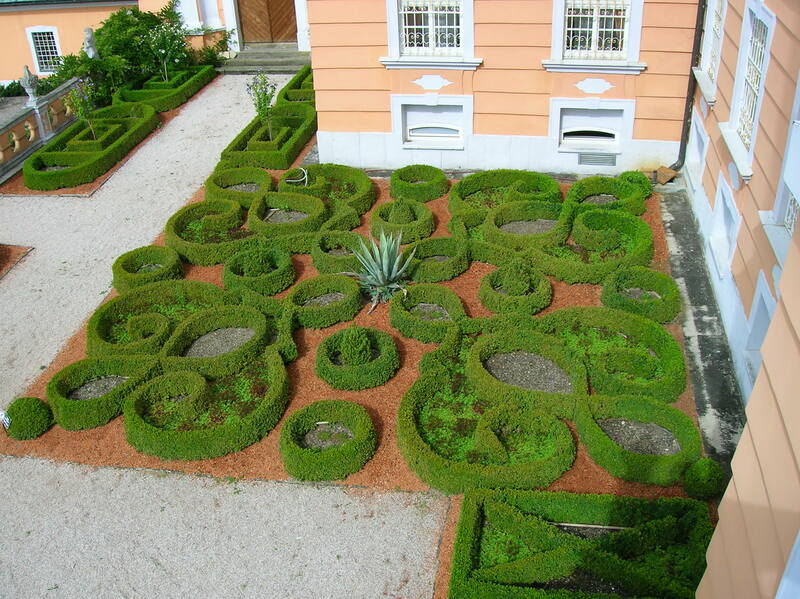 The guide let us into the terraced garden, Baroque in style. From the edge of the garden I got an excellent view of the surroundings, with homes in the valley and a forest beyond. I thought to myself that these last two hours had been well-spent. I made my way to an outdoor table at a pension’s restaurant in the picturesque square not far from the museum of toys, motorcycles and bicycles. I sat in the sun, facing the cheery, pink chateau façade for almost two hours, eating chicken, writing postcards and reading. Then I climbed the hill to the town’s church. I tried all three doors but found it locked. I had read in a brochure that the interior was in Rococo style. It was a pity that I could not see the interior. Walking past the half-timbered, derelict-looking house on Railroad Street, I retraced my steps to the train station, where I waited for the new, clean train back to Karlovy Vary. After another scenic train ride, I made the next bus from Karlovy Vary to Prague with minutes to spare and spent a relaxing two hours thinking back on my exciting day. I had come across Chyše chateau by chance while flipping through my old Kamenný klíč publication of castles and chateaus. 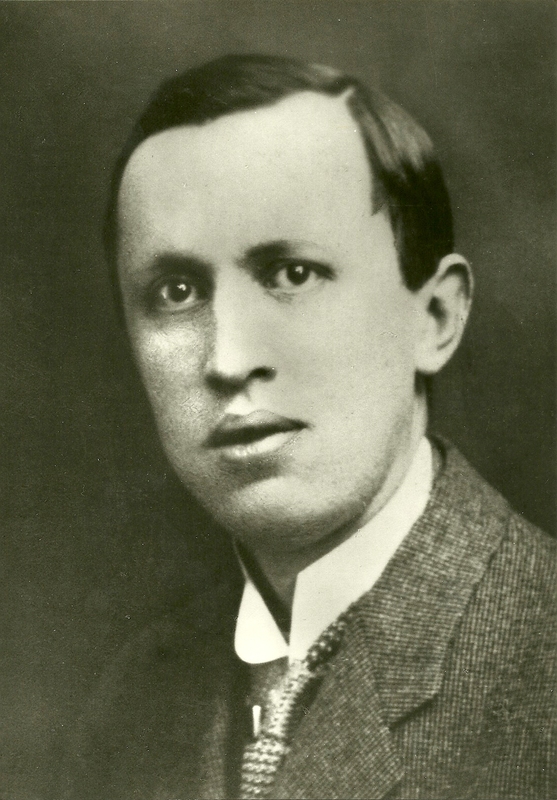 When I read that the tour included an exposition about Karel Čapek, I was hooked. 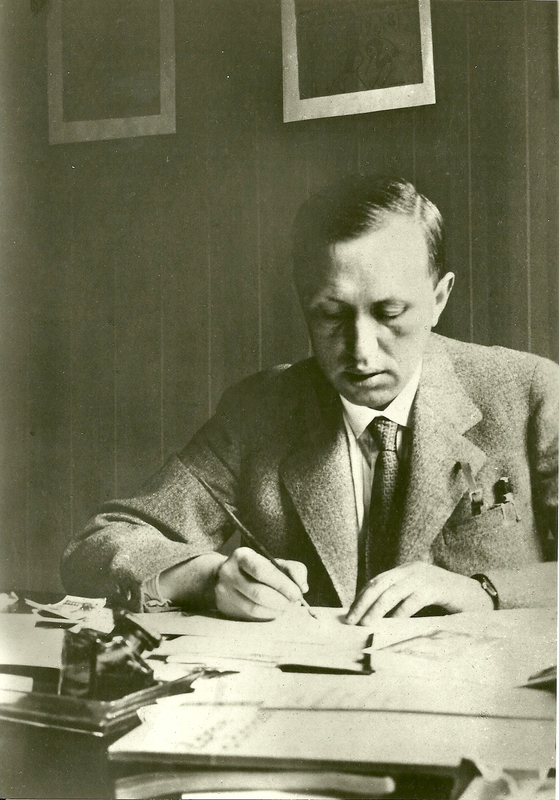 Karel Čapek had been perhaps the greatest Czech writer ever, a master at all kinds of genres – science fiction, mysteries, novels, poetry, fairy tales, nonfiction, travelogues and more. I had studied his works for my master’s degree in Czech literature and was eager to see an exhibition about him. I had never known that he had worked as a tutor at the chateau. Curiously enough, I had never heard of Chyše before that, even though it had been opened to the public since May 30, 1999. The only public transportation was by train through Rakovník, but I would only have five minutes to change trains, or I would have to wait two hours for the next train. The transportation back to Prague was awful as well. So, I went to Karlovy Vary again and took a taxi to the chateau that would charm and bewitch me as soon as I set eyes on its romantic, Neo-Gothic façade (I love Neo-Gothic facades!) and impressive park. I also hoped to visit the brewery next door. I had heard that Chyše made a decent beer. Six years later, its new owner Burián z Gutštejn restored it and built a hospital and a church as well. Although he died in 1489, his descendants manned the castle until the 16th century when it fell into the hands of the Lobkovicz family. 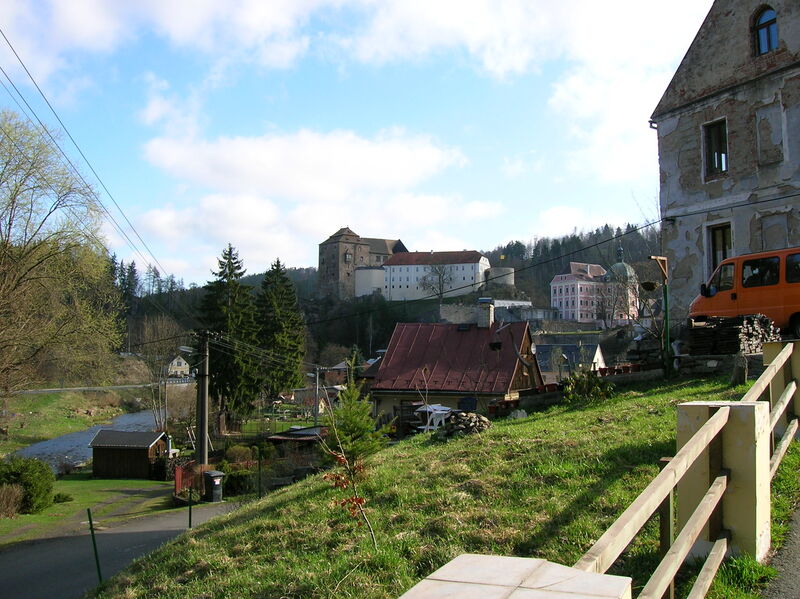 It was Mikuláš from Lobkovicz who changed the appearance from Gothic castle to Renaissance chateau in 1578, but a year later he sold the chateau to Bohuchval Berka from Dubé. 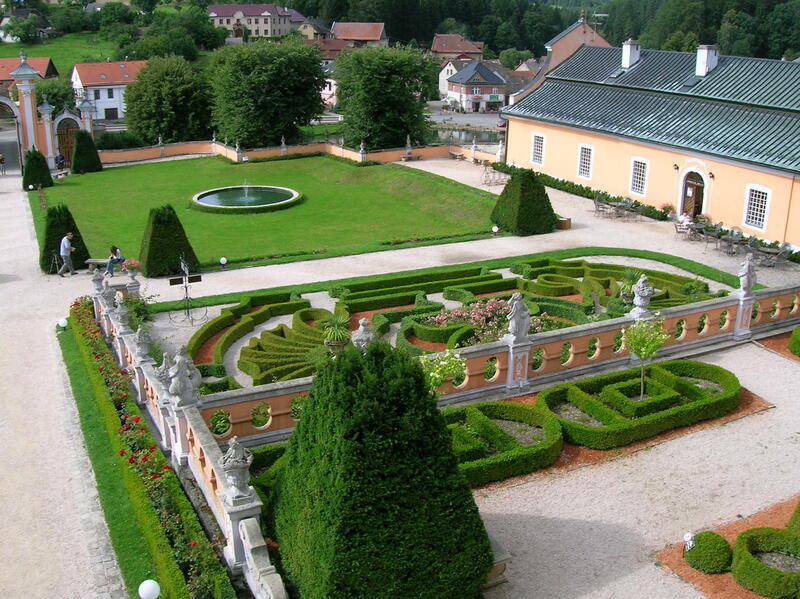 A turning point in the chateau’s ownership came when Count Prokop Lažanský obtained it during 1766. Chyše would stay in his family until it was confiscated due to the Beneš decrees that took property from German citizens in 1945, as the owners at that time had German citizenship. From 1946 to 1976 the chateau served as several types schools, but in 1976 it was closed and became decrepit and dilapidated. Chyše was put up for sale in 1993. During 1996 it was saved thanks to the efforts of Vladimír Lažanský from Děčín, who bought it for 10 million crowns. The chateau was open to the public in 1999. The first room of the tour presented pictures of the chateau in a dilapidated state during 1996, when Lažanský bought it. It seemed a miracle that it had been transformed into such magical beauty during three years, I thought to myself. Even the well-manicured park had looked like a jungle back then. We walked through one room that exhibited a spectacular Renaissance ribbed vault as well as black-and-white graphic portraits. The next room would become one of my favorites. Baroque master Brandl’s fresco with a biblical motif swirled above me in vibrant colors. I also was impressed by the enticing stucco work in the space as well as the coat-of-arms above the fireplace. From there we entered the space in which concerts and weddings are held. The white Baroque stucco decoration included cherubs, shells and swirls. I was fond of the pink, Czech tea service. The Baroque closet and dresser also amazed. The Venetian porcelain in the following room was one of the most exquisite and fascinating works I have ever seen in a chateau. The blue tea cups were decorated with white lace, it seemed. Even in a close-up examination, the decoration looked like lace. But it was really painted onto the cups. The wooden chandelier also got my attention. There was Czech porcelain from the early part of the 19th century in the Summer Dining Room. I saw an exhibition of porcelain and pots in the small space where they prepared food near a hallway that led to the kitchen. In another hallway was a lush carriage from 1913. It had been used for weddings. Then we went upstairs. I was taken in by the painted, diamond shapes on the ceiling in the hallway. The apartment of Prokop II Lažanský included portraits of his great grandparents and a 400-year old fireplace that dazzled. A clock with what looked like gold griffins on its sides dated back 150 years. A portrait of Count Vladimír Lažanský, who had employed Karel Čapek, hung in the portrait gallery. I noticed that he had a puffy moustache, beard and oblong face. Two tables were set with delicately painted Easter eggs, as it was a few weeks before Easter when I was there. The small library contained 30,000 volumes. In it I saw a black-and-white fireplace in Second Rococo style; it appeared to be made of marble. The piece of furniture that got my attention in the children’s room was a dresser that marked the end of Rococo style and the beginning of Classicism. A bedroom was decorated in white – a white bed, a white dresser, a white chaise lounge. It emitted a feeling of purity. The furniture in this room was about 200 years old. Then we came to Karel Čapek’s modest room which only got sunlight in the early morning, not providing optimal writing conditions. The furniture consisted of a small, wooden bed and a desk on which was an old bottle of Mattoni water with a German label, a white porcelain cup, about 10 books, an inkpot and a porcelain dog. 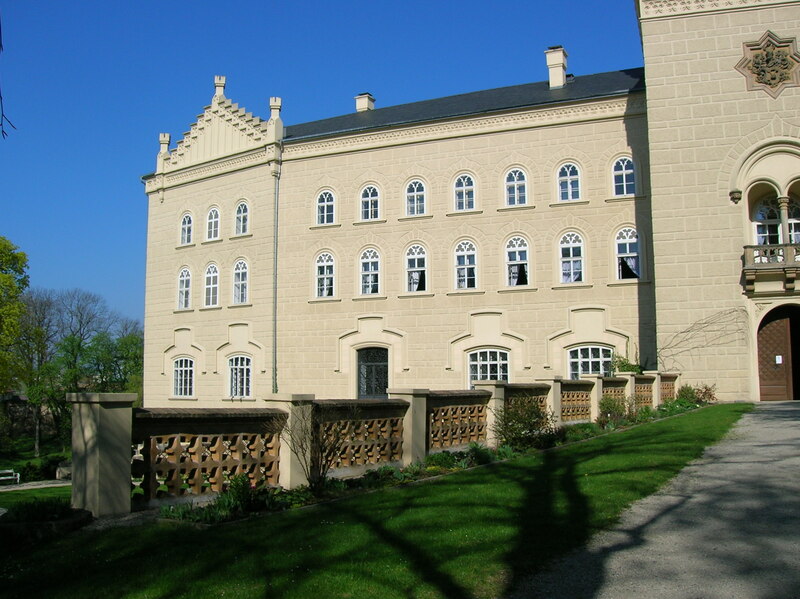 Čapek spent five months at Chyše Chateau, having tutored the boy in Prague for two months prior to his stay there. In his letters the to-be renowned author complained about not having time for his writing, though he did get some inspiration. During his tenure there a factory employing 14- and 15-year old teenagers exploded. Perhaps that influenced his decision to write Krakatit in 1933. He also spent time chatting with the gardener, as he was a lover of gardening and even wrote a book about the subject. I could not believe that I was actually seeing a place where Karel Čapek had lived! He had walked on these floors, slept there, wrote there, woken up to the sun shining through the window there. This small, modest room was the highlight of the tour for me. I felt as if I was stepping on holy ground in this almost claustrophobic room. After leaving Čapek’s room, I saw hunting trophies – a zebra decorated a wall as did the heads of antelopes. A boar hung above the doorway while a leopard skin rug decorated the floor. I am not too fond of anything to do with hunting, though. Soon the tour was over, and it was time to visit the Karel Čapek exposition in part of the chateau’s ground floor. I stared for a long time in awe at the round, wooden desk and blue- with-white decorated chair where Čapek had written the philosophical, third volume of a trilogy called An Ordinary Life. The chair did not look especially comfortable, and I wondered if Čapek had suffered from a bad back. 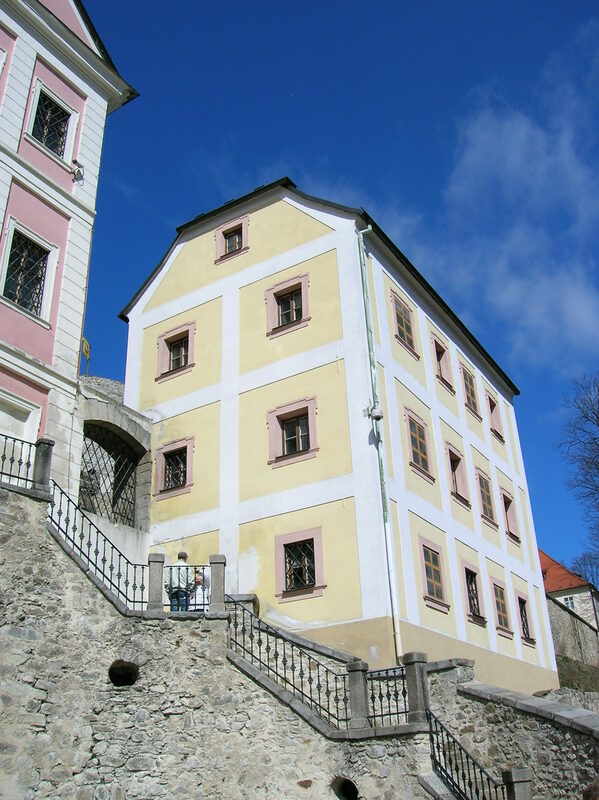 I read information about Čapek’s tenure at Chyše Chateau on the walls. 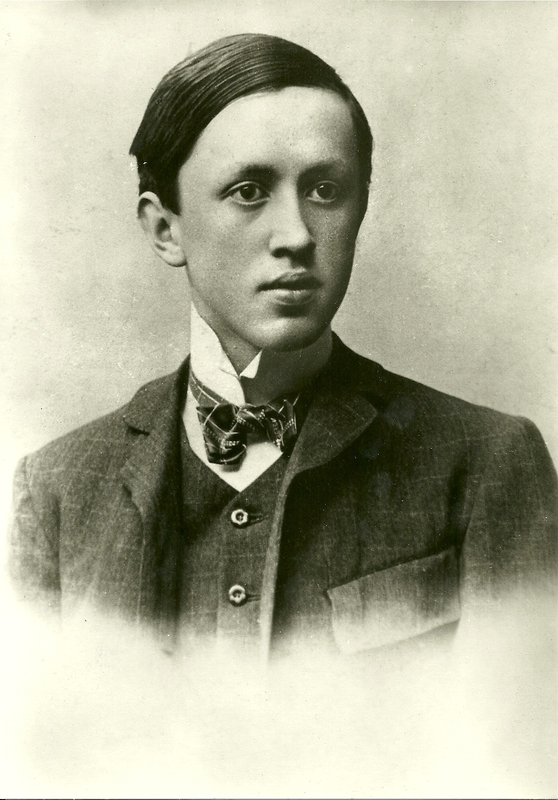 The then aspiring author had earned 100 crowns monthly for his tutoring of Prokop IV. That was almost nothing today. I wondered if it had been a substantial amount back in 1917. After his seven months in Prague and Chyše, he did become an editor, by the way. I also saw reproductions of photos of Čapek, the chateau and 13-year old Prokop. Vladimír Lažanský sported a top hat and big moustache. I also looked at an aerial view of the town. The reproductions of Čapek’s letters were intriguing. In one correspondence with Czech writer S.K. Neumann, he complained that he had no time for writing here. Various editions of a book about Capek’s sojourn there, called Kruh mého času and authored by Marie Šulcová, also decorated one wall. On the walls I also took notice of quotations from An Ordinary Life and scenes from his plays such as The White Plague and The Makropolis Thing. His time during 1932 in Karlovy Vary was documented as well. There, Čapek had worked on the second volume of his trilogy, Meteor. But that was not all Chyše had to offer. I also saw the brewery next door. While beer-brewing in this town dates back to the 16th century, this brewery was constructed between 1839 and 1841. Behind the brewery is what remains of Renaissance walls from the original building. The chateau’s brewery closed down in 1932 due to its inability to keep up with other brands . It was used as a granary and then boiler house. In 1994 the place began to deteriorate. 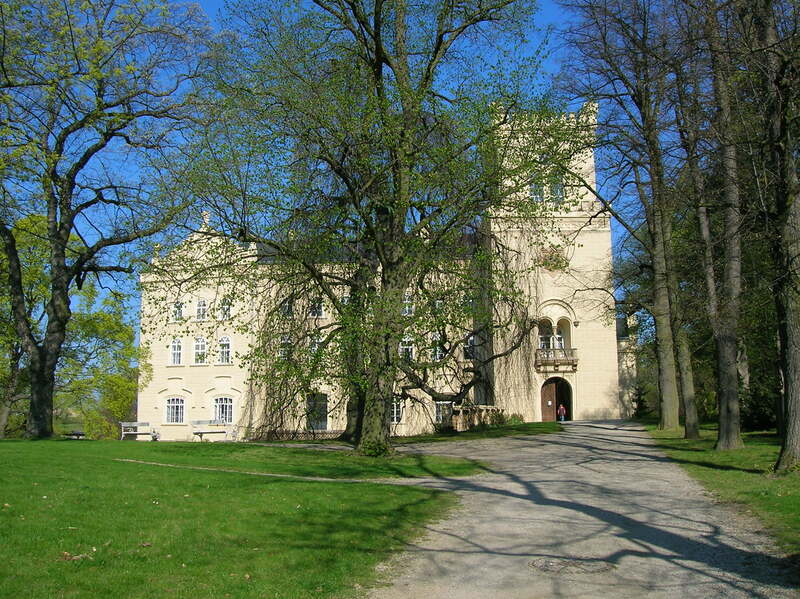 Then, during 2003, the Lažanskýs bought it, and restoration began. Even the cellars were restored to their Renaissance appearance. The brewery opened again June 1, 2006. I found the beer very tasty. It was a golden color, not too light and not too dark. I tend to drink gold-colored or dark beer, so it was perfect for my palette. After I had walked through the dazzling park, I had lunch in the brewery restaurant as I devoured chicken with ham and cheese and, of course, diet Coke. I was happy that day as I made the journey back to Prague, via taxi and Karlovy Vary, with a two-hour Student Agency bus ride that did not feel long at all. About eight years ago I mentioned to several English students how I loved traveling to castles and chateaus on the weekends. “Have you been to Nové Hrady near Litomyšl? You have to go there!” my 25-year old female student blurted out, explaining that she was from a nearby town. 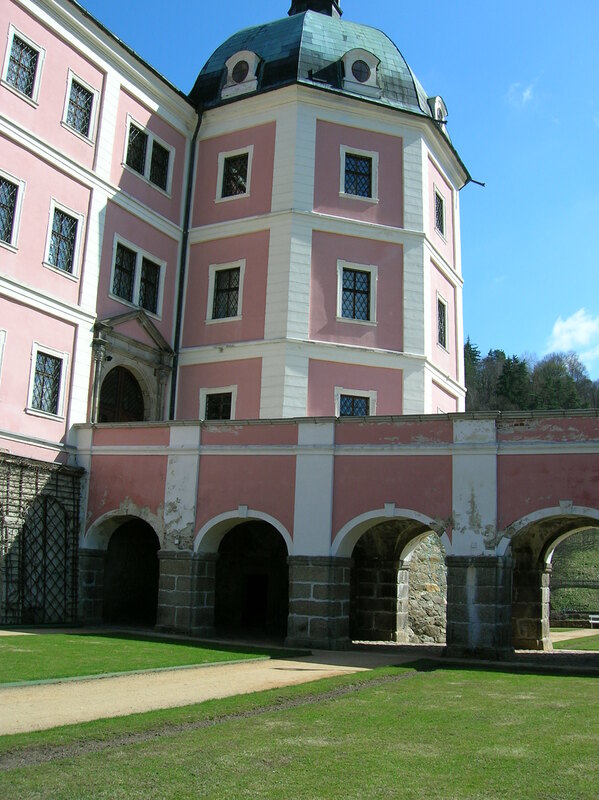 I had visited Nové Hrady Castle in south Bohemia, but I had never heard of a Nové Hrady Chateau in east Bohemia. I could not find any public transportation at a convenient time, so I put this chateau on the back burner and explored others. 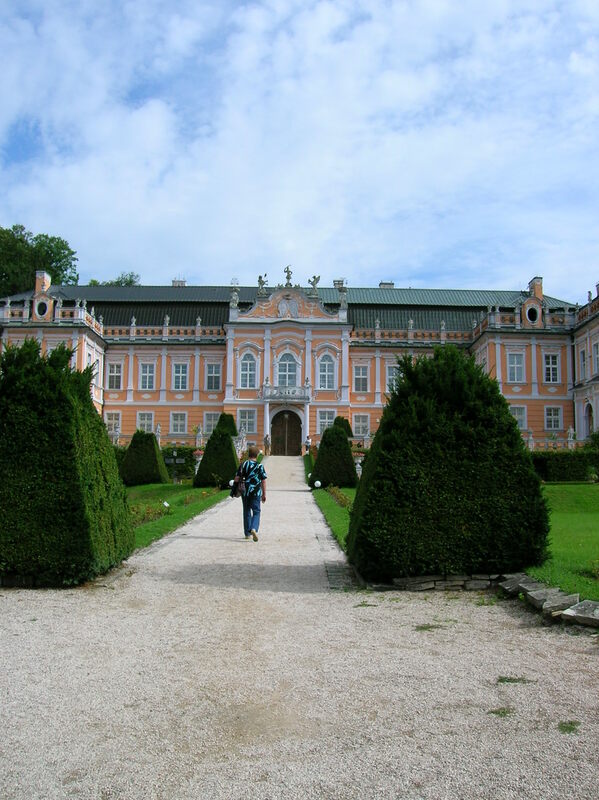 Then, on a Friday in 2011, I was so eager to see the Rococo chateau I had looked up on the Internet, that I took the Student Agency bus to Hradec Králové, and then made the one-hour trip to Litomyšl. From there a friend who owned a cottage nearby gave me a lift to Nové Hrady. 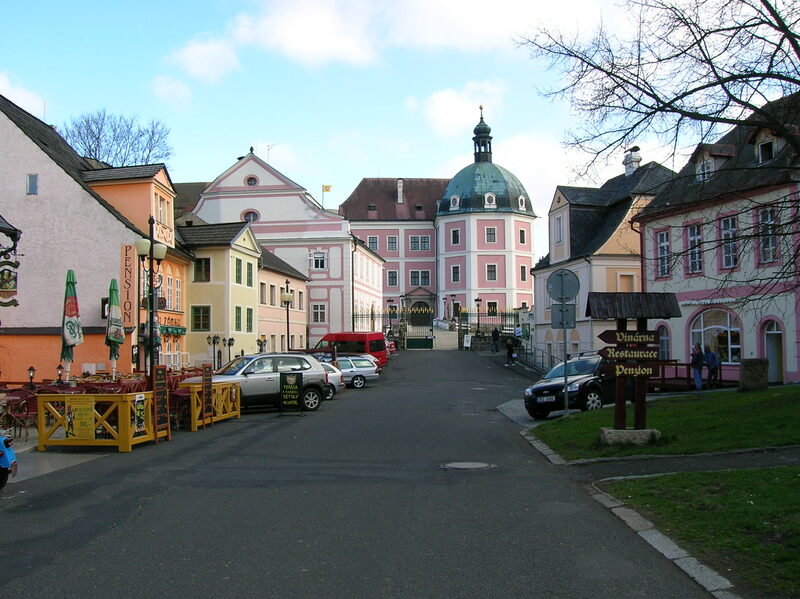 The history of Nové Hrady began with the construction of a church on this site in the 12th century. After the Hussite Wars in the 15th century, a Gothic castle called “Nový Hrad” or “New Castle” was erected there. In the 16th century the castle was transformed into a Renaissance chateau, but during The Thirty Years’ War it was plundered and destroyed. 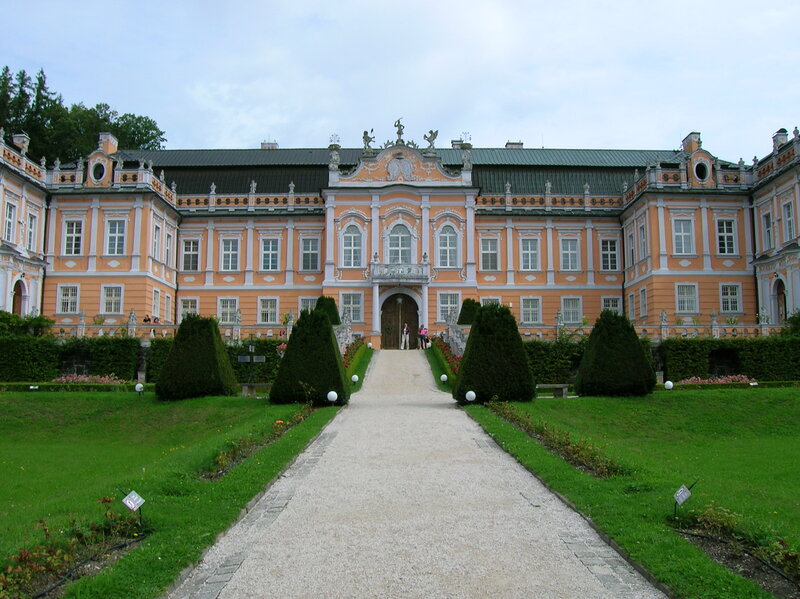 Duchess Anna Barbara Harbuval de Chamaré bought it in 1750, and Nové Hrady got its Rococo appearance from 1773 to 1777, when her son, French nobleman Jean-Antoine Harbural de Chamaré made it his summer residence. 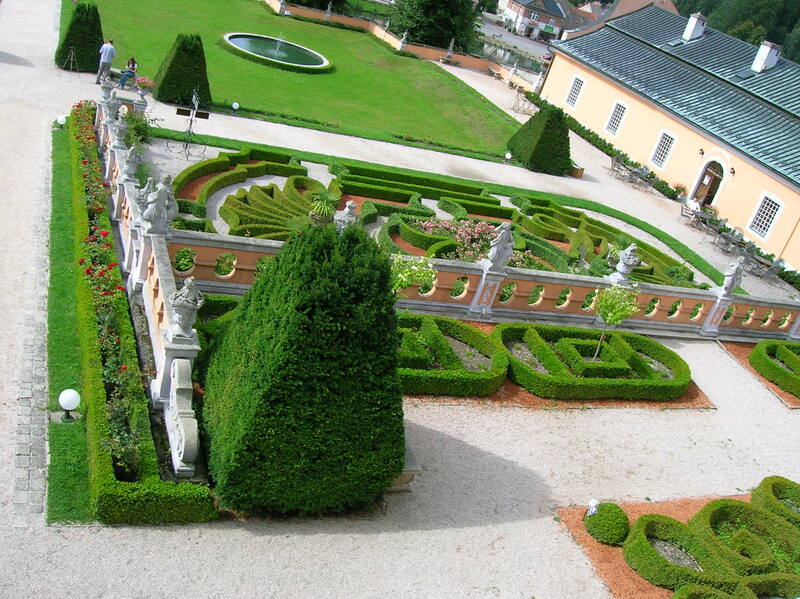 Back then it was dubbed the “Small Schonbrunn” or “Czech Versailles.” The French garden, English park and chateau chapel were created at this time, too. In 1935 Knight Bartoň of Dobenín purchased it and carried out the needed repairs. 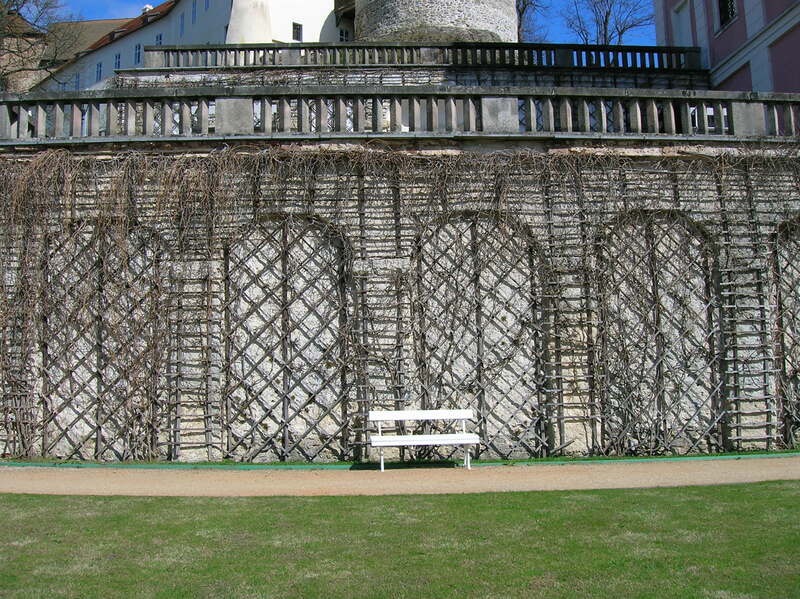 During the Second World War, the SS and Hitlerjugend occupied the chateau. In 1948 it became the property of the state. 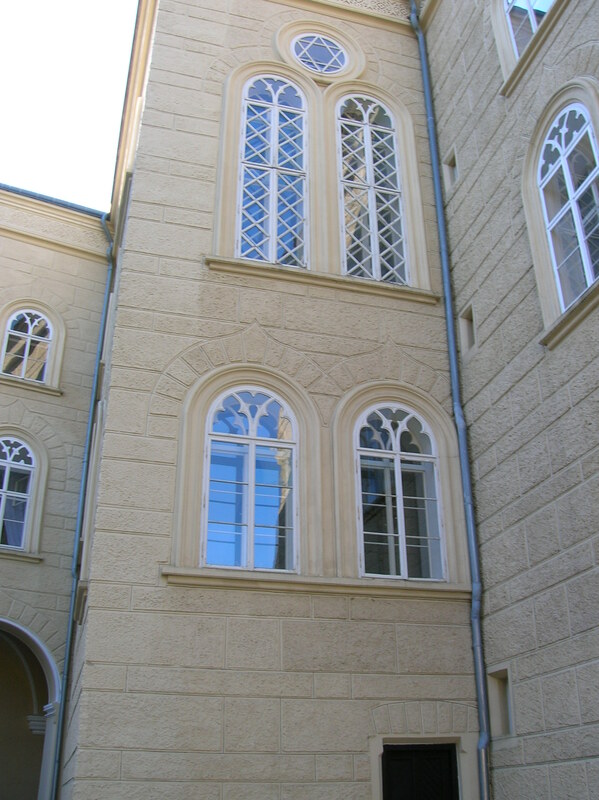 One wing of the chateau was turned into an elementary school, which existed here until the 1980s. An exhibition of Rococo art was placed in another wing. During the 1950s the chateau’s situation became even more desolate: Its basement was transformed into a fattening farm for pigs. 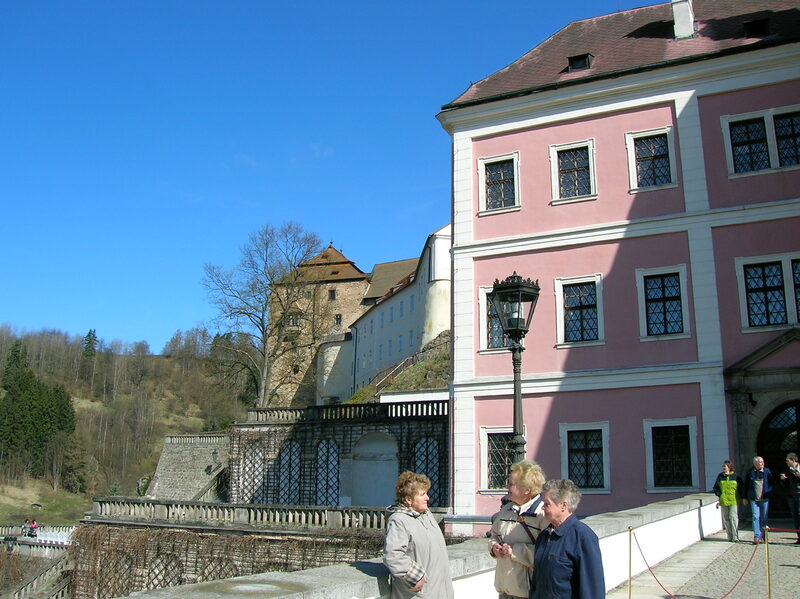 Reconstruction was carried out in various phases, but the chateau was still in a very decrepit state when it was returned to its original owner’s grandson, Josef Bartoň, in 1990. Unfortunately, he did not renovate the chateau. Instead, he put it up for sale. In 1997 the Kučera family from Prague purchased it. It finally opened to the public in 2001. Now it looked so majestic that it was impossible for me to imagine the chateau in such terrible condition. 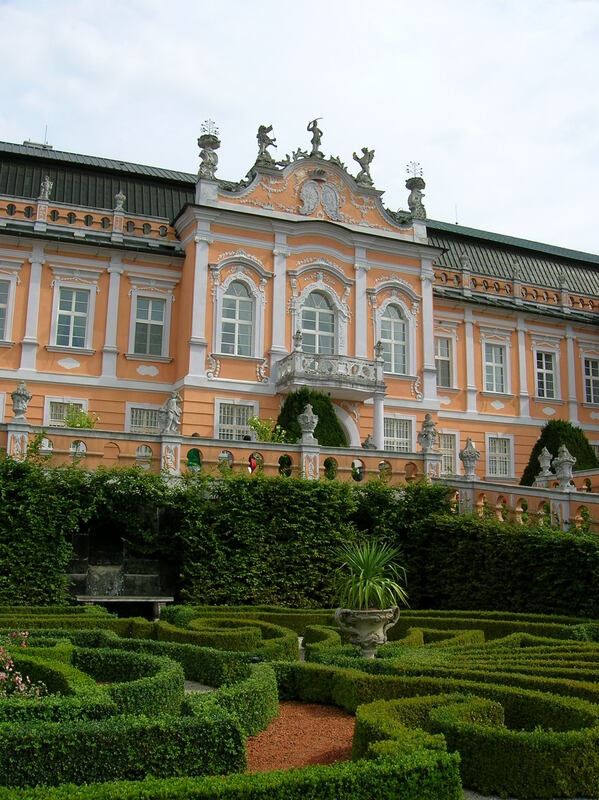 After going through a three-part gate, I walked through a Rococo garden with fountains and ascended a lavish staircase studded with statues. I liked the coral orangish color of the chateau that made the exterior appear playful, cheerful and vibrant. I had visited enough chateaus to I know a little about the Rococo period. The key word for this style was ornate. Small sculptures often appeared as did lavish mirrors and tapestries. Rococo was even more extravagant than the Baroque style that had preceded it. The tour began in the hallway below a monumental staircase enriched with putti statues. The side walls of the entrance hall were decorated with hunting trophies. We entered the large Main Hall with its creamy yellow walls and white rich stucco décor. The yellow and white colors made for an airy, joyful combination. The white tile stove was original, in Late Baroque style, and a white piano stood nearby. The crystal chandelier from Empress Marie Theresa’s era used 64 light bulbs and weighed 180 kilograms. One window looked out to the Classicist circular gazebo with Baroque theatre of evenly sheared high bushes. In the wall the guide showed us two doors that opened outward to reveal a bar. From the terrace I saw the Rococo garden I had passed through to get to the box office. The staircase looked even more elegant from this perspective. Next we entered a Baroque bedroom. The pillowcases on the Baroque bed had delicate, lace patterns. A brown table, oak closet and desk featured intarsia. A kneeler also hailed from the Baroque era. In the following room there was a grandfather clock that the guide claimed was impossible to repair. A kneeler featured an engraving of a house and trees using the intarsia technique. A Baroque intarsia table from Holland with motifs of flowers, birds, butterflies and vases rounded out the room. Then came the Rococo Salon. The table and armchairs had a white floral design. The table impressed me the most with the ornate, gold ornamentation of its legs and sides. A white wardrobe decorated with green laurels was pleasing to the eye. The couch and chairs were pea green with yellow, flaunting a floral pattern. The green color combined with yellow gave the furniture a cheerful appearance. Unfortunately, original Rococo chapel had been destroyed. The present chapel was sparse. It featured two stained glass windows and a large carving of Jesus Christ on a cross. Then it was time for another Rococo style room featuring intarsia. The tops of two dressing tables were decorated with beads shaped into green swirls on a blue and black background. The space also contained two intarsia dressers decorated with floral motifs and a kneeler boasting intarsia. In the former kitchen the 18th century grandfather clock, varnished in red, was engraved with Oriental themes, one feature of the Rococo period. A desk featuring Oriental themes, depicting Chinese people and nature, caught my eye. The two jewelry boxes were Chinese, too. The next room was called the Classicism Room. Classicism relied on order, symmetry and simplicity and began after 1765 as a reaction to Baroque and Rococo. It was connected with the French Revolution. The striped grey with tan couch and two chairs certainly fit the Classicist description. In a display case there were two elegant fans. However, a clock glittering with gold made me think of the Empire Style that would be featured in the next room. After all, the gold and black color combination was one trait of the Empire style that corresponded with the era of Emperor Napoleon and his military maneuvers into Egypt during 1796. Oriental themes also played a part in the Empire style. Sure enough, in The Empire style room, black and gold freely mingled. A black clock featured two black men wearing gold loincloths and sporting heads of golden hair. Another gold clock was decorated with a seated angel. The furniture featured Oriental and animal themes. The next room was set up in the Biedermeier style, from the first half of the 19th century. Carving and intarsia still appeared in smaller objects. A picture of a semi-circular square flanked by columns showed a passion for symmetry and order. I wondered if the painting depicted a place in Rome. The striped chairs and couch featured a simple yet elegant style. The Smokers’ Salon was all about green. The rug was green, the cushions on the brown chairs were green, a partition was green, and a loveseat was decorated with green and tan stripes. This room was designed in the Art Nouveau style from the beginning of the 20th century. After the tour I explored the garden. There was a pond to my left, near the road. One part consisted of trees and plants on a slope, rising in tiers. It looked wild and untamed. Purple flowers lined a path behind the back gate that had its private garden. I spotted the Baroque theatre of shrubbery and the Classicist garden summerhouse. Further on, there was a hotel, an orangery, a paddock for horses, and an area where deer were bred. I was very impressed with the Rococo exterior of the chateau, and it had been intriguing for me to see furniture and objects from various periods inside. The tour enlightened me as to the differences between eras. My understanding of the various time periods was enriched. I loved the black with gold combination of some objects. I wish the chateau had more paintings, though. A painting gallery of Baroque and Rococo art would have really added to the already stunning tour. Soon I got back to Litomyšl, where I ate some chicken with peaches and cheese – my favorite – and then hurried to catch the 1 pm bus back to Hradec Králové. Upon arriving there, I ran to the other side of the terminal, where the Student Agency bus was about to leave for Prague. I made it just in time. Tracy A. Burns is a writer, proofreader and editor living in Prague.